Fall schedule is up and ready! We’re excited for our first dance of the season this Saturday with a concert at 6:30 and dance at 8:00! Lots of new things this year and special events at each dance! Morgantown WV, August 24, 2016. 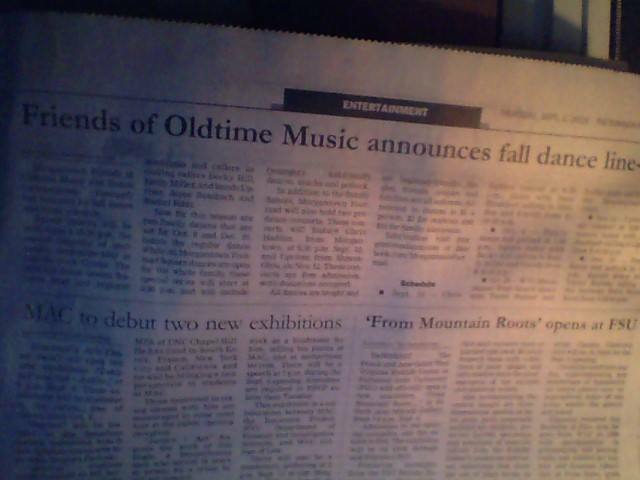 Morgantown Friends of Oldtime Music and Dance (Morgantown Footmad) has released their fall dance and event schedule for the Fall 2016 Season. Square dances are held the second Saturday of each month Sept- May from 8:00- 10:30pm at Marilla Park Center. The 2016 Fall Dance season features local and regional musicians and callers including callers Becky Hill, Emily Miller, and bands Upriver, Joyce Rossbach, Rachel Eddy, and more. New for this season are two special Family Dances that will take place on October 8th and December 10th before the regular dance. 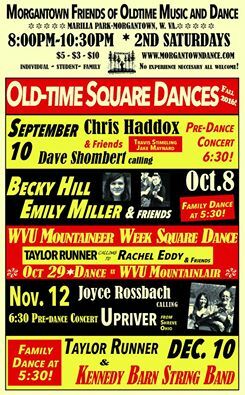 While all Morgantown Footmad Square dances are open for the whole family, these special series will start at 5:30 and will include (younger) kid-friendly dances, snacks and potluck, and fun for the whole family! This series is supported in part by the Outreach Fund of the Country Dance and Song Society. In addition to the Family Dances, Morgantown Footmad will also hold two pre-dance Concerts. These concerts will feature Chris Haddox from Morgantown September 10 at 6:30, and Upriver from Shreve Ohio on November 12th. These concerts are free admission with donations accepted. September 10th: Chris Haddox Concert 6:30 , Dance with Dave Shombert calling to Chris Haddox and Friends 8:00-10:30pm. October 8th: Family Dance and potluck 5:30, Square Dance with Becky Hill calling to Emily Miller and friends 8:00-10:30pm. December 10th: Family Dance and potluck 5:30. Square Dance with Taylor Runner calling to the Kennedy Barn String Band 8:00-10:30 pm. ← Previous Previous post: News and Updates about our Fall 2016 season!